It’s a fact that new launches or properties under construction are usually more popular among property buyers – especially when the real estate market is piping hot! They are usually much modern in terms of design and architecture, better facilities and most importantly it’s NEW and you do not have to worry about dealing unknown issues – such as leaks, hidden cracks etc. But the problem is that you’ll have to wait for at least 3-4 years (for most cases) before you get your keys to your brand new home. And during the construction, you’ll still have to make mortgage repayments even though you have not officially taken possession of the unit physically. This is definitely not feasible, especially for cash-flow investors. Another problem would be the Additional Buyers’ Stamp Duty (ABSD). If this is your first property, then that’s fine. But if it is not, you will definitely need to fork out extra cash for the ABSD, even if you decide to sell your place eventually after getting keys to your new home. Although you can apply for remission after that, you will still pay this amount first within 2 weeks of exercising the Option. So how is buying a resale property easier? 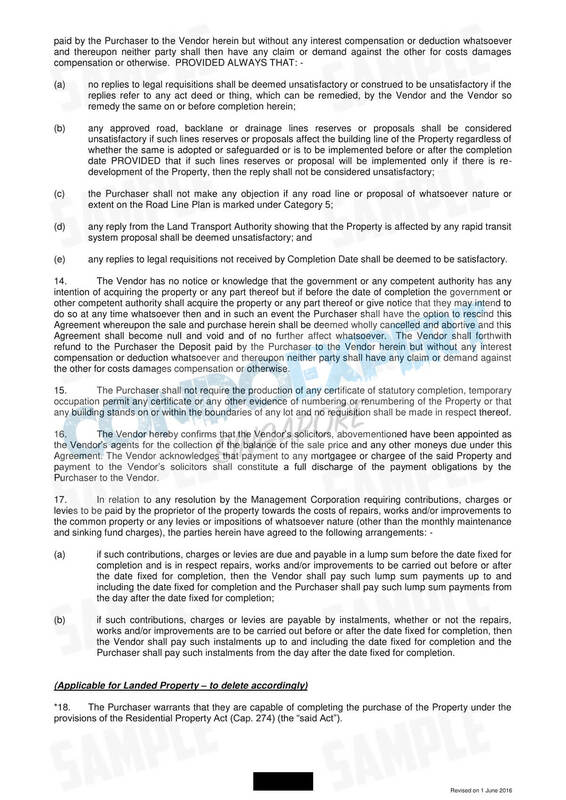 Firstly, let me give me you a comprehensive walkthrough of the general procedure when buying a resale property in Singapore (or completed ones). In order to secure your purchase at the agreed purchase price with the seller, you will be required to pay him/her an Option Fee which is worth 1% of the purchase price in exchange for the Option-To-Purchase (OTP) document from the seller. Assuming the purchase price for the property is $1 million, the Option Fee will work out to be $10,000. It will be payable to the legal owner of that property. This amount will also be considered as a part of the deposit for the purchase. In return, the legal owner will then grant you the option for his/her property by giving you a signed OTP. The OTP is a legal contract which basically gives you (the buyer) the exclusive rights to purchase the property at the fixed & agreed price, within a stipulated period of time (usually between 2 to 3 weeks and we usually call this the ‘option period’). In other words, during the period of 2 to 3 weeks after receiving the OTP, the ball is your court. The seller is not allowed to sell this property to another buyer, or back out from this deal. Well, that’s provided they don’t mind getting legally sued by you. During that 2 to 3 weeks, you will decide whether or not to go ahead with the purchase of this property. Once you’ve made a decision, just go ahead and meet up with your appointed solicitor to exercise the option to purchase. Do that note if you are unable to exercise the option by the end of the given time period, your OTP will be void and the 1% option fee which you have given to the seller initially will be forfeited. I currently own a property but I am planning to upgrade. So how can I purchase the next property without getting caught with the ABSD and yet secure this property at the price I’ve agreed with the seller? It’s a pretty common situation for most homeowners who are planning to upgrade to private property in Singapore. The answer to the above problem is the timeline. 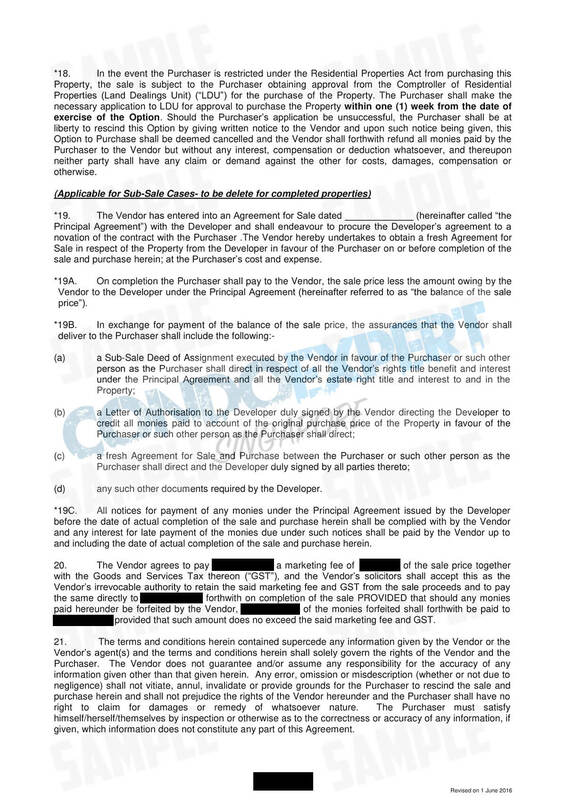 By entering into an OTP agreement with the seller, you have not legally purchased the subject property. It only counts when you proceed to exercise the option to purchase. Basically, you just need to ensure that your current property is being sold before you exercise the option. That means the buyer for your property has exercised his/her option for your current place. Once he/she has done that, you are clear to go ahead to exercise the option for your next home. But I need more time to sell my current home and 2 to 3 weeks’ of option period isn’t enough. Yes, selling a home in Singapore usually takes some time and a couple of weeks may not be sufficient – unless your current property is a super hot listing in the market and selling at an absolute bargain. What you can do is to negotiate for a longer option period with the seller of the property which you intend to purchase. It can be weeks or months – up to both parties to decide. But this has to be done and written down on the OTP before you place your option fee. However, do note that this is not a foolproof method and we usually don’t recommend this unless necessary. The reason is that if you are still unable to sell your current place by the time the option period lapses, your option fee will be forfeited by the seller. And if don’t want to forfeit, you will have to proceed with the purchase and be subjected to the ABSD which is applicable to your situation. Another reason why this method isn’t ideal is that it will put you under severe pressure for the sale of your current property. When the clock’s ticking, you will likely be forced to accept a price way below your expectations in order not to lose out the option fee you’ve paid or end up having to pay for the ABSD. In the OTP, the seller will also indicate the expected duration for the sale to be completed – which is usually around 8 weeks from the date you exercised your option. It’s always good to discuss this with the seller entering the OTP agreement – just to make sure that nobody gets homeless during the transition. Just a quick note. Most of the time, buyers will be caught by bank loan issues. So it’s always advisable to do an In-Principle Approval (IPA) with your preferred bank before searching for your next property or entering into an OTP agreement. You can proceed with the loan application once you received the OTP from the seller. 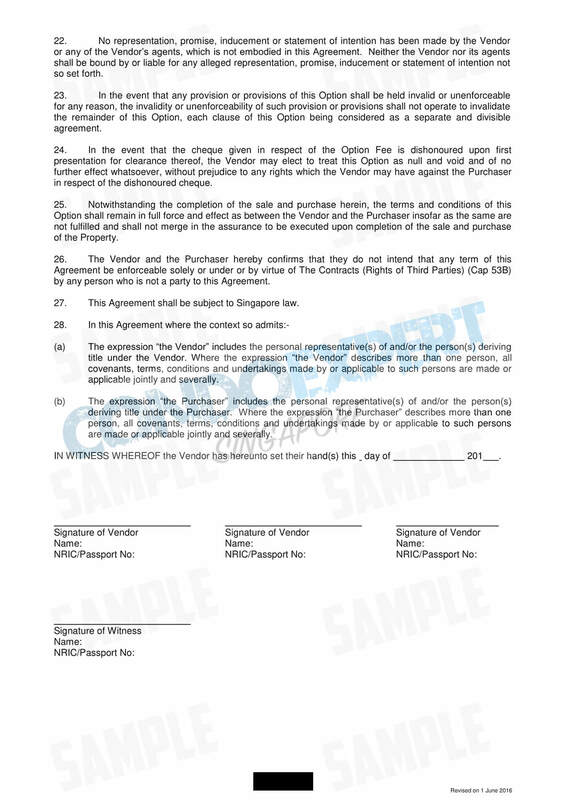 If you’ve decided to proceed with the transaction, all you need to do next is to sign on the acceptance copy of the OTP (refer to OTP sample above) and have it delivered to seller’s solicitor, together with the balance of the deposit (which has already been agreed with the seller earlier). These will be handled by your appointed solicitor. The deposit usually comprises of the Option Fee (1% of purchase price) which was paid earlier to the seller in exchange for the OTP and another 4% upon exercising the OTP. 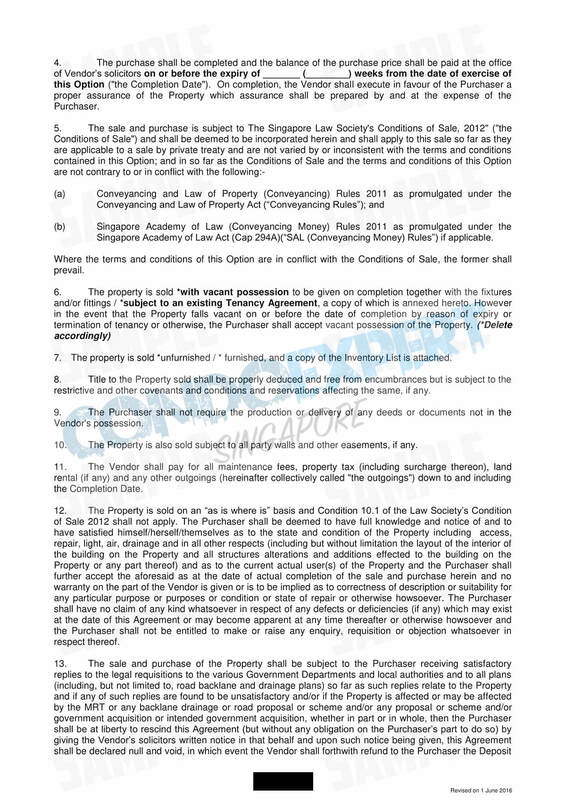 Please note that the balance deposit can be paid either to seller’s solicitor’s conveyancing account or the Singapore Acadamy of Law. This will be decided before the seller grants you the OTP. Upon signing the acceptance copy and making payment for the rest of the deposit, you will enter into a sale and purchase (S&P) agreement with the seller. The contract date is the date when you signed on the acceptance copy. This date is exceptionally important for you to take note if you decide to sell your property within the next 3 years. Moving on, do note that it is not mandatory for both buyers and sellers to sign an S&P agreement after exercising the OTP as the contractual terms and conditions will be similar to whatever has been written in the OTP. So when do I pay for the stamp duty? Just to be clear, Buyer’s Stamp Duty (BSD) rates of up to 4% are still chargeable regardless of how many properties you currently own. It is payable within 14 days of signing the S&P agreement. The exact amount can be calculated through the IRAS website. 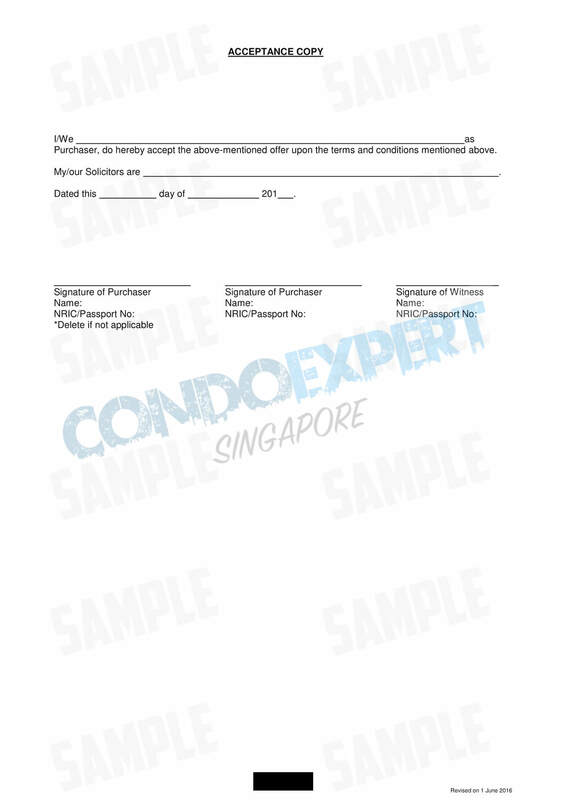 Right after the contract is concluded, your solicitor will lodge a caveat in the Registry of Titles (which holds the registration details of the property under Singapore’s Land Titles Act) or the Registry of Deeds (which holds the registration details of the property under Singapore’s Registration of Deeds Act). 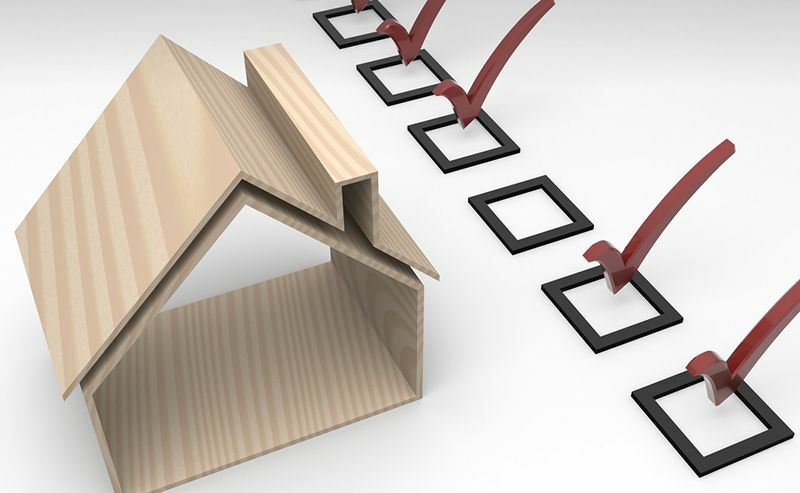 In addition, your solicitor may also check the certificate of title, which verifies the true ownership of the property that you’re purchasing. At the same time, they may also check if the property will be affected by any developmental plans by the government. If so, such conditions may nullify the entire sale transaction. If you need further legal advice with regards to your property purchase, you can contact our trusted firm LegalWorks Law Corporation at +65 6325 1722 and look for Ms. Dorothy Tay. Just mention that you are being recommended by me – Edison Foo from SRI, and she’ll advise you accordingly. Otherwise, you can just contact me and I’ll link both of you up. At this stage of the transaction, you are pretty much home and dry. As mentioned earlier, the completion date has already been communicated with the seller at the start, before that OTP. With that said, this date may be often be adjusted due to the in-between processes. Not to worry, your solicitor (and the seller’s solicitor) will take care of it. Upon completion, the seller will be required to hand over the keys of the property to you, in exchange for the remaining amount (95%) of the transaction. It will also be taken off care by solicitors of both parties. 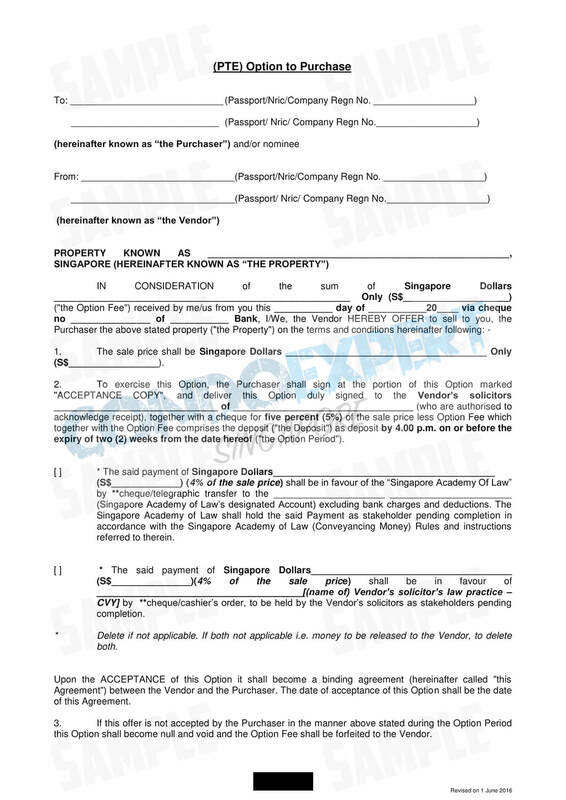 Please note that this 95% of the transaction amount comprises of cash, CPF monies, and a bank loan. Regardless if you are going to use your CPF monies, taking a bank loan or paying this property with full cash, you will need to have these ready by the completion date. The seller didn’t provide all the keys and have missing access cards. Legally, the seller will only need to provide the buyer with the main door key, the mailbox key, and just one access card. The rest of the inventory is not mandatory. In some cases, if the seller received a vehicle transponder or car label from the management of the property, he/she will have to return it. This is mandatory. What if the property looks thrashed after I collected my keys? What are my rights as the buyer? Legally (again), the property should be delivered to you in the same condition (except for fair wear and tear) as it was on the OTP date unless otherwise agreed between both the buyer and seller. However, if you see that there are severe physical damages being done to the property and it is likely being done intentionally, you can always inform your solicitor upon inspecting the property and they will raise a dispute with the seller’s solicitors before releasing the balance transaction amount. Hope I’ve helped you understand more about a buying a resale property in Singapore through this article. However, what I’ve covered are based on generic situations. If you have any questions or need help in planning for your next property purchase, please feel free to drop me a note.